It’s important to choose the right lock for your door, which is why we provide a large variety of locks & latches for the home and workplace. Mortice deadlocks for example prioritise the fundamentals of the original European lock: sturdy, dependable, and easily operated. Ironmongery Experts have an impressive assortment of mortice dead locks for sale, ranging from the authentic 5 lever design to the modern cylinder configuration, all available in both brass and stainless steel in an array of different sizes. If you want your door to stay closed even when unlocked, we also stock many types of mortice sashlocks and mortice bathroom locks. These hybrid locks include a spring latch while taking up no additional space, and come in various designs and sizes, allowing you to customize your chosen aesthetic. On the other hand, if you’re looking to abandon the locking mechanism altogether and settle on a latch for your door, we carry a range of mortice latches to suit your needs. These are more suitable for indoor purposes, and are compact enough to be virtually unnoticeable once installed. For those with more modern, sliding doors, our selection of sliding door locks & latches is sure to appeal to your tastes, boasting a diverse range of designs for all environments. Similarly, we also carry a large spectrum of digital locks. These electronic fixtures come complete with a keypad and are most useful in workplace environments, or when securing valuable possessions. There are many types to choose from, and each one allows customization of its unique passcode. If you’re looking for larger locks for outdoor or industrial use, we carry a range of components for budget locks, fire brigade locks and padlocks. These fixtures are tough and heavy, designed to ward off even the most tenacious of thieves. We also stock a varied assortment of magnetic catches and roller catches for indoor use. These fixtures are essential for providing the finishing touches on your cupboards, drawers and wardrobes, as well as keeping your doors closed without resorting to a latch. For owners of rebated doors, our rebate sets are a crucial investment. 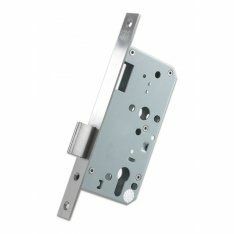 These allow mortice latches and locks to fit securely into place when using these types of doors, since the usually square edges won’t align otherwise. No matter what door you have, or what style you’re searching for, we can lock it, latch it, and match it.